Meet ATI Truck Repair, a Full-Service Truck Repair Shop in Delta, B.C. 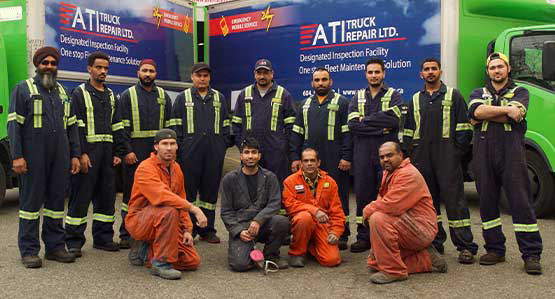 ATI Truck Repair is a family business founded by brothers Anup and Iqbal Singh in 2003. Anup has worked as a diesel mechanic since tenth grade—he now has over 30 years of truck repair experience—and Iqbal brings a love of customer service and communications to the shop. Together, they’ve made a better life for themselves and their customers by consistently providing high-quality truck repair and maintenance services for all models and brands of trucks, trailers, buses, motorhomes, RVs, flat decks, vans, and dump trunks, for big fleets and individual owners alike. At the same time, our outstanding customer service has earned ATI Truck Repair an excellent reputation in the British Columbia truck and trailer repair and body shop industry. At ATI Truck Repair, our technicians, mechanics, and staff work together—and work hard—to make sure the best service is delivered to every single one of our customers. And with constant training, skill upgrades, and the most up-to-date tools and equipment, we can handle even the toughest, most challenging truck repairs, including severe collision damage, box rollup and box barn door repairs, electronic diagnostics, and DPF repairs. We’re also experts at heating and refrigeration repairs, paint, and handling all insurance claims. Our team loves working on trucks, but we also love working with people—each other and our customers. You’ll find we’re enthusiastic and welcoming, performance-oriented, and committed to making sure you’re satisfied. You can trust us to stay in contact with you while your truck is being repaired, and to get the work done when we say we will. Thanks for taking the time to learn more about ATI Truck Repair! Our team looks forward to providing you with the best service in the truck repair industry.